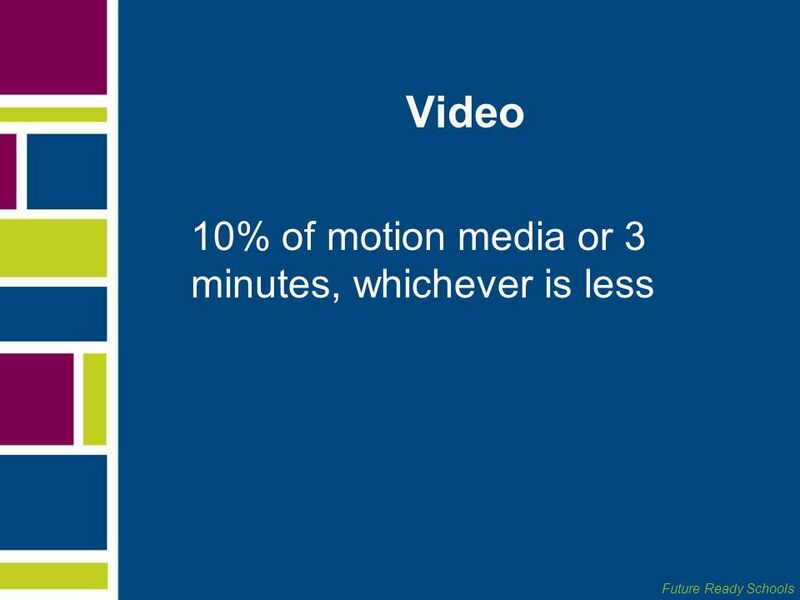 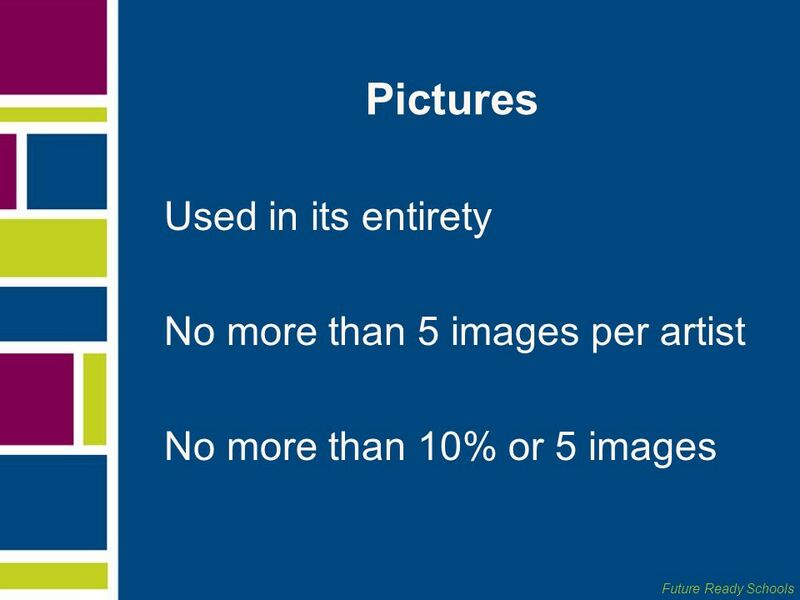 You find several pictures on a Web site, download them, and use them in your PowerPoint for your conference presentation. 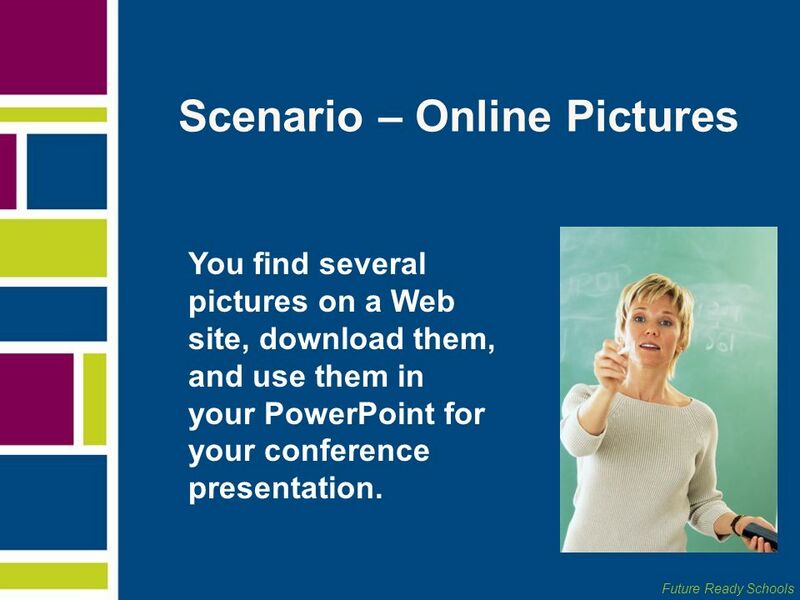 You find several pictures on a Web site, download them, and use them in your PowerPoint for your conference presentation. 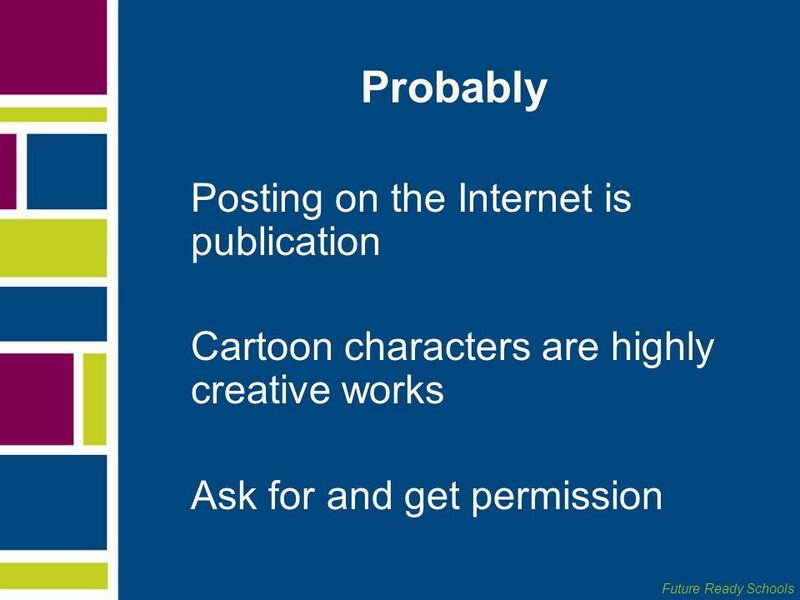 Is this a copyright violation? 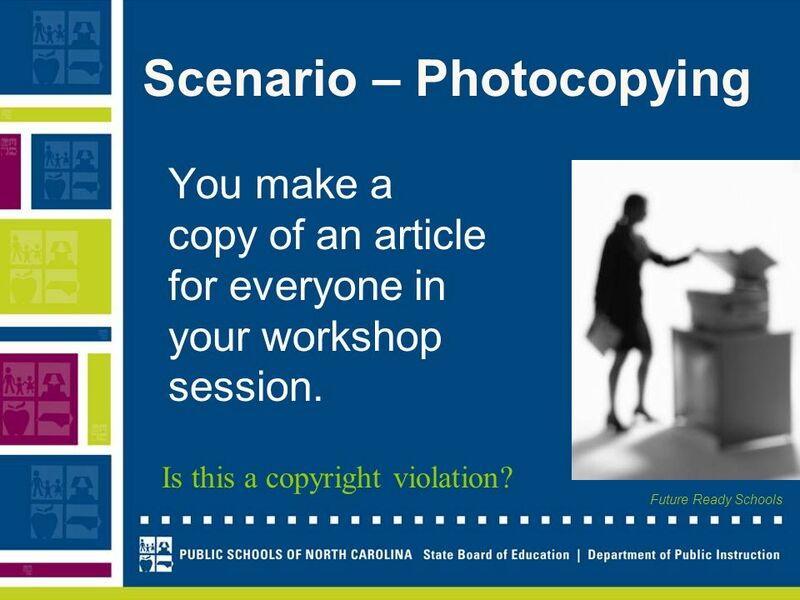 You make a copy of an article for everyone in your workshop session. 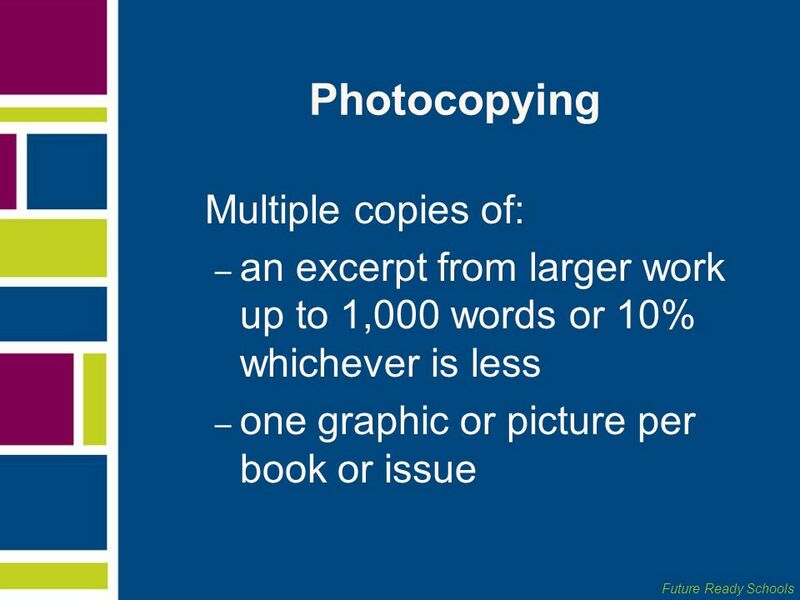 Is this a copyright violation? 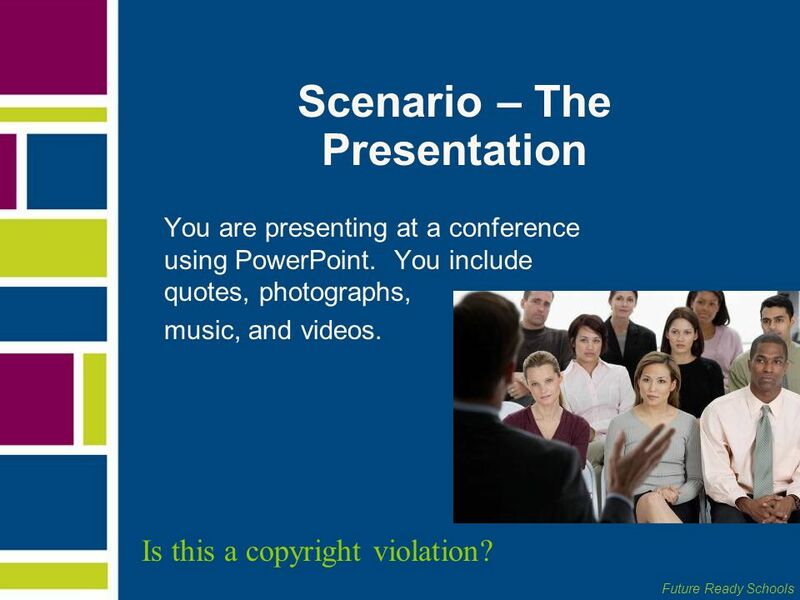 You are presenting at a conference using PowerPoint. You include quotes, photographs, music, and videos. 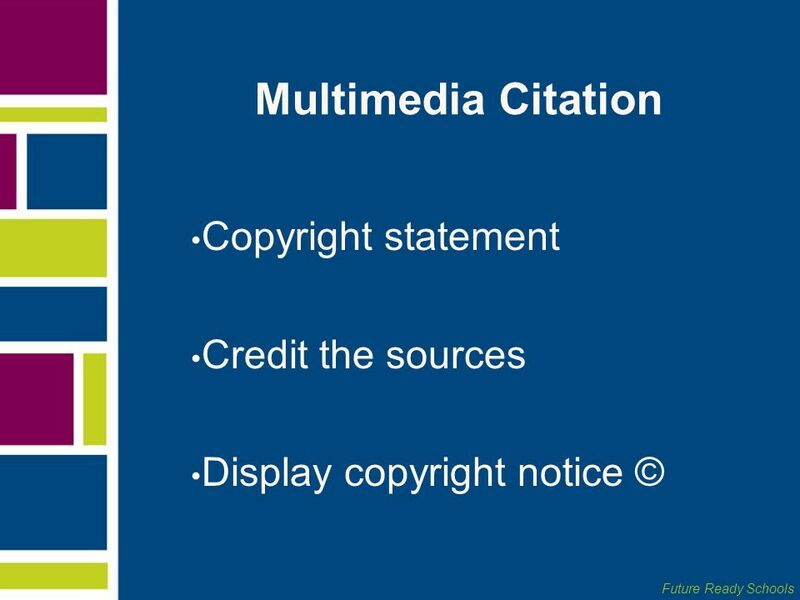 Violation Access or boot file is part of the program and there is no brevity provision in fair use for computer software Is this a copyright violation? 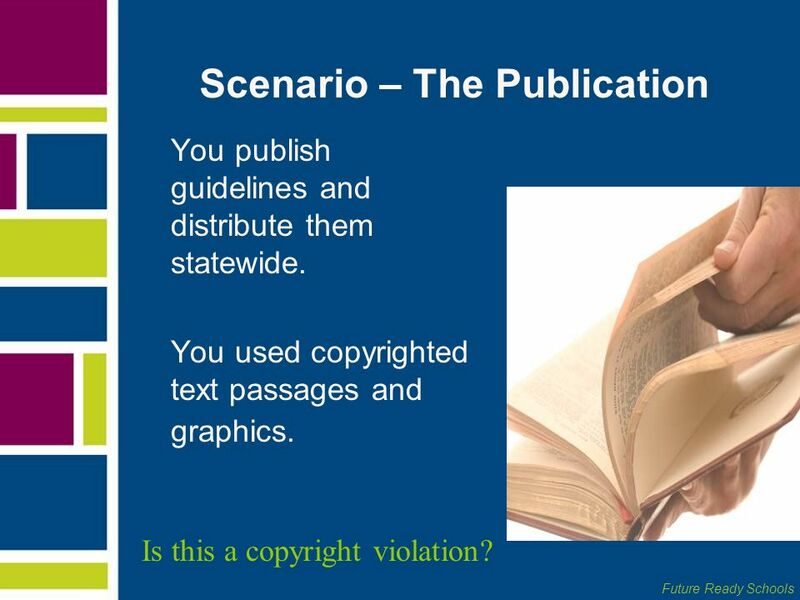 You publish guidelines and distribute them statewide. You used copyrighted text passages and graphics. 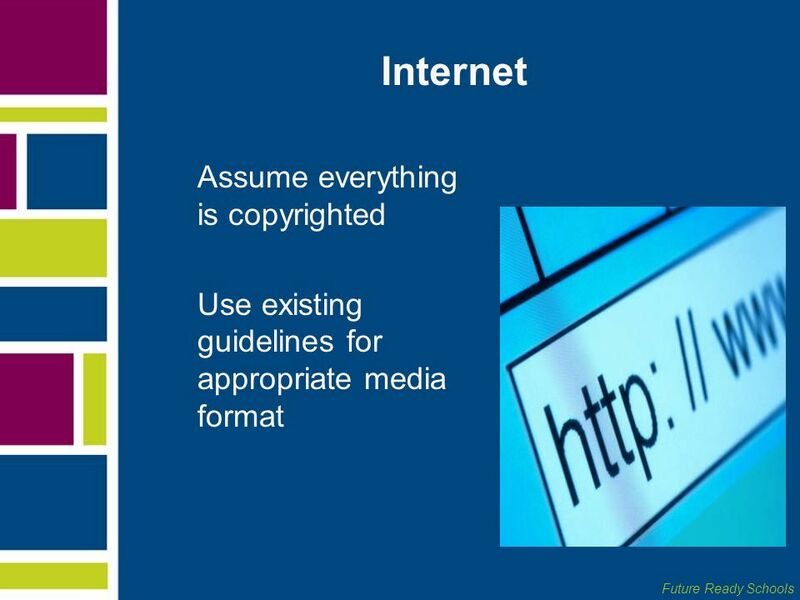 Violation Access or boot file is part of the program and there is no brevity provision in fair use for computer software Is this a copyright violation? 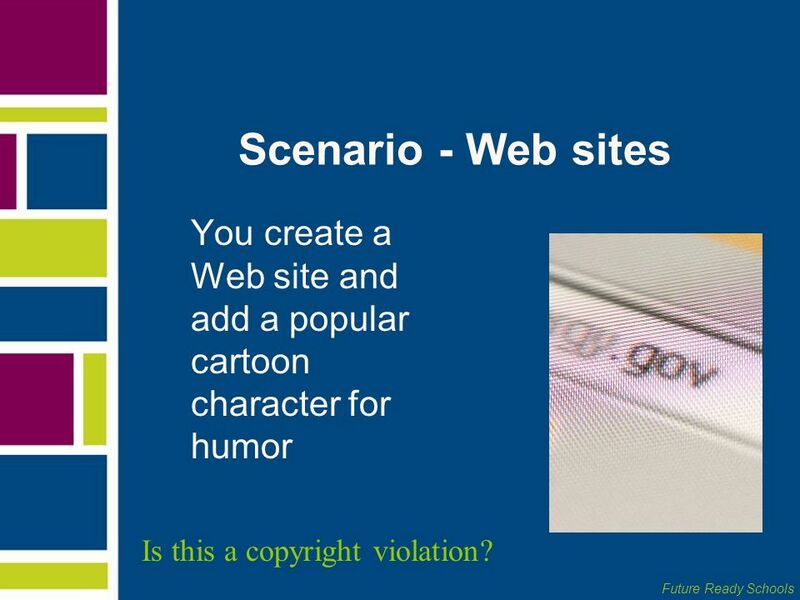 31 Scenario - Web sites You create a Web site and add a popular cartoon character for humor Is this a copyright violation? 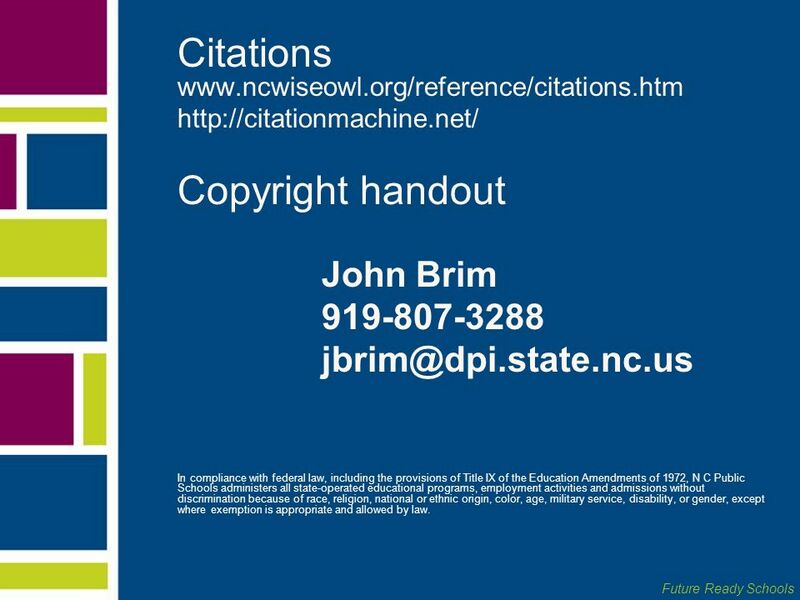 Copyright handout John Brim In compliance with federal law, including the provisions of Title IX of the Education Amendments of 1972, N C Public Schools administers all state-operated educational programs, employment activities and admissions without discrimination because of race, religion, national or ethnic origin, color, age, military service, disability, or gender, except where exemption is appropriate and allowed by law. Download ppt "Copyright or Wrong? 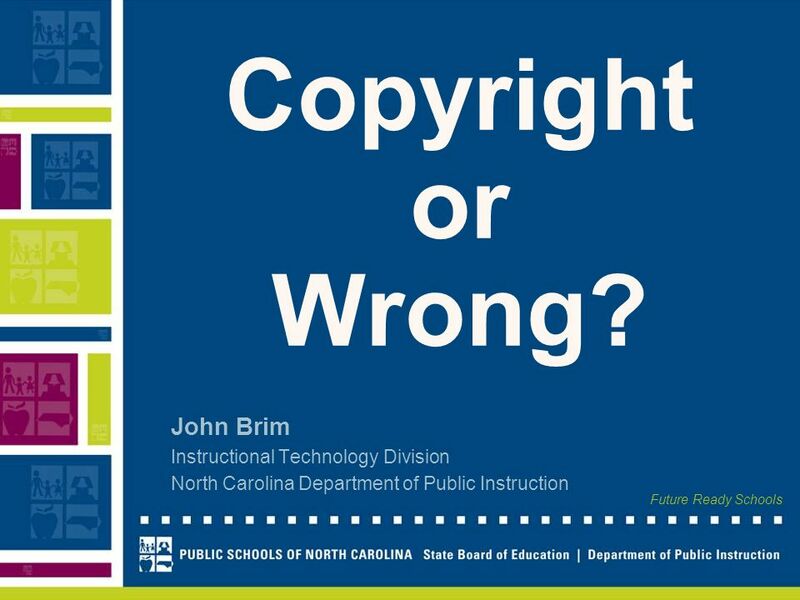 John Brim Instructional Technology Division"
Copyright and Multimedia G, Kenneth. "marchingband.jpg." 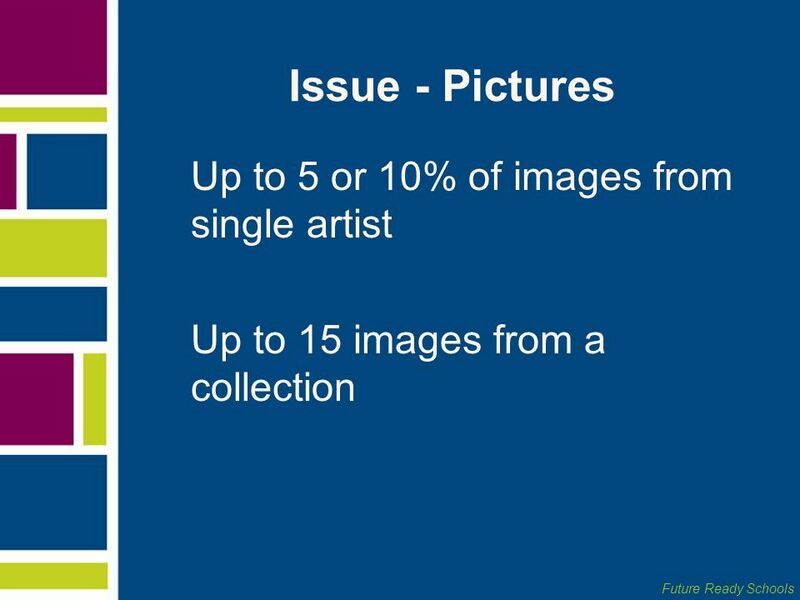 Pics4Learning. May Source: Copyright: A Guide To Information and Resources 2 nd Edition. 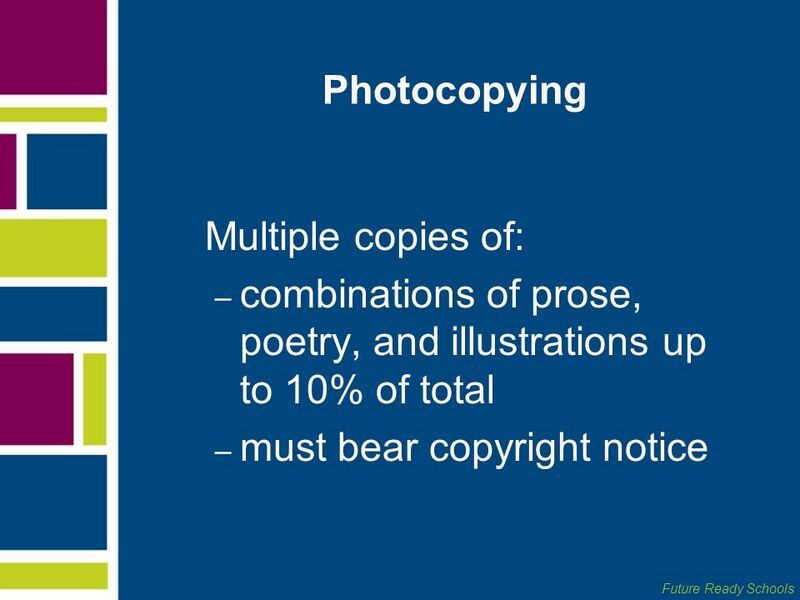 Welcome to Copyright! 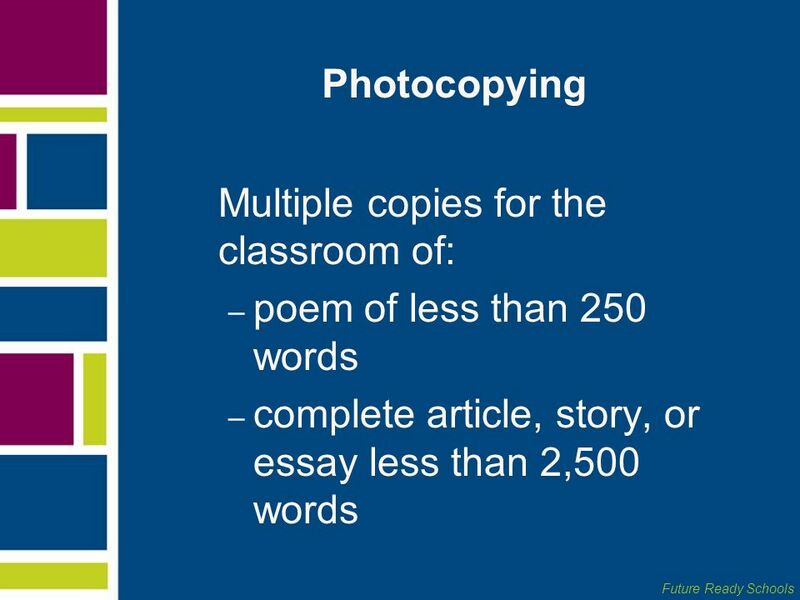 Download presentation materials, share ideas, and discuss concepts shared in this session by joining our Edmodo Group with the following. 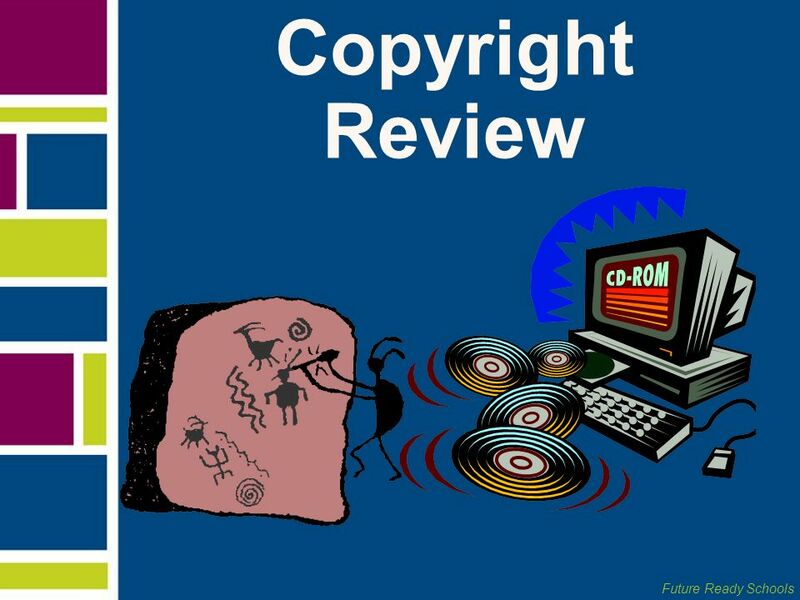 Is This ‘Fair Use’? 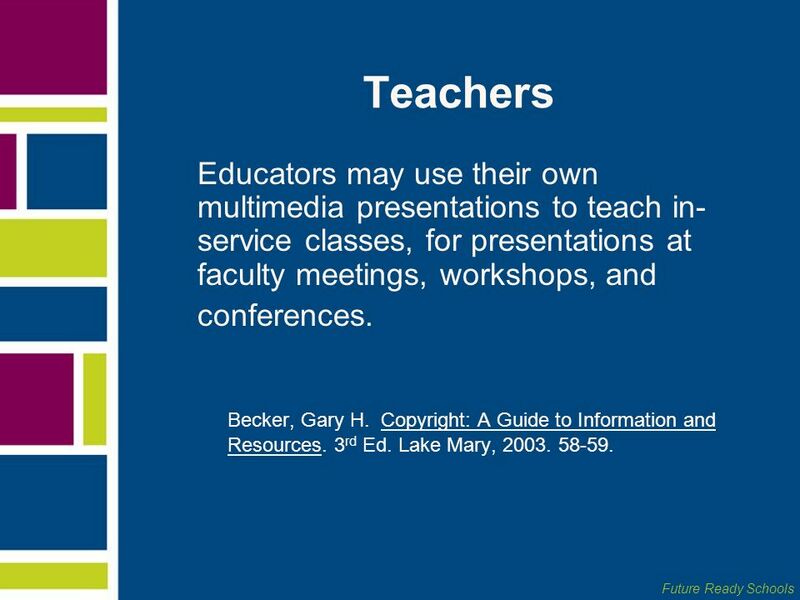 Katie Steele TE 868 Summer 2009. 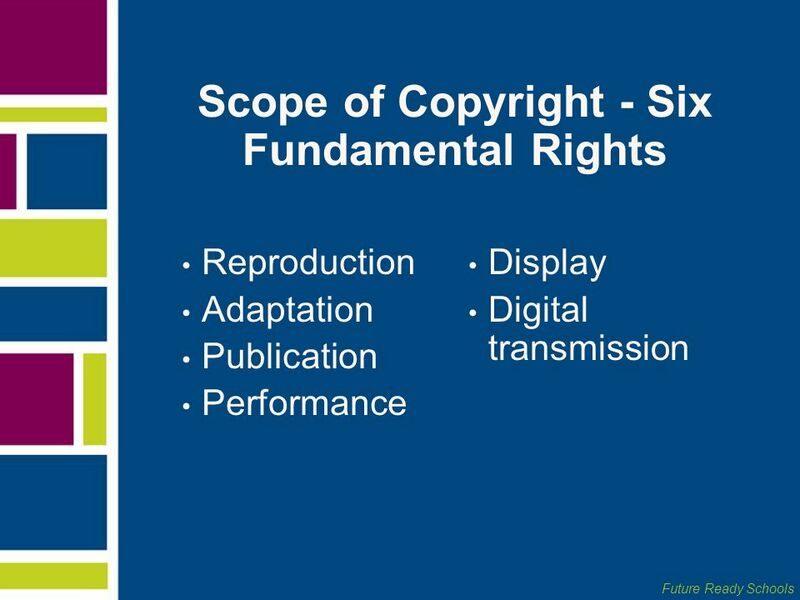 Dan Sparlin NCDPI The Copyright Conundrum A Dilemma of the Digital Age. 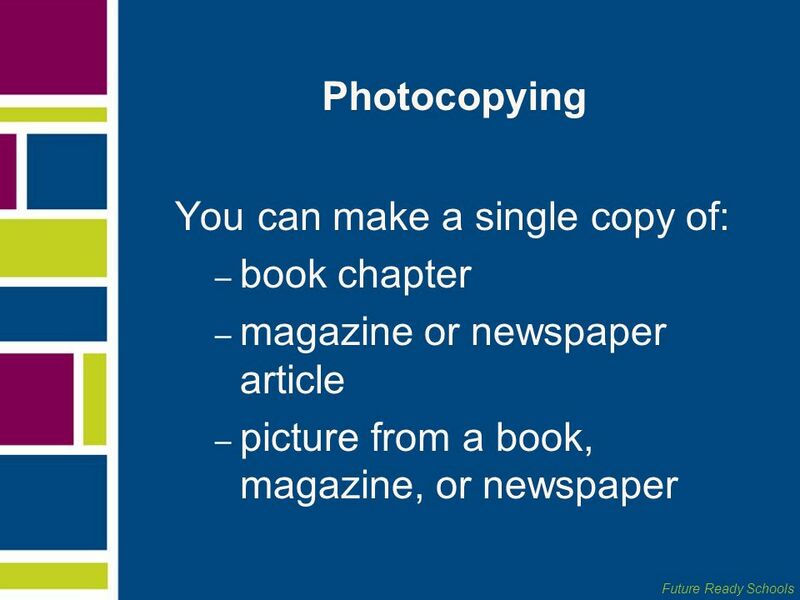 Copyright: The Basics + Q’s and A’s by Clare Tomasch, LCPS Librarian August 2003. 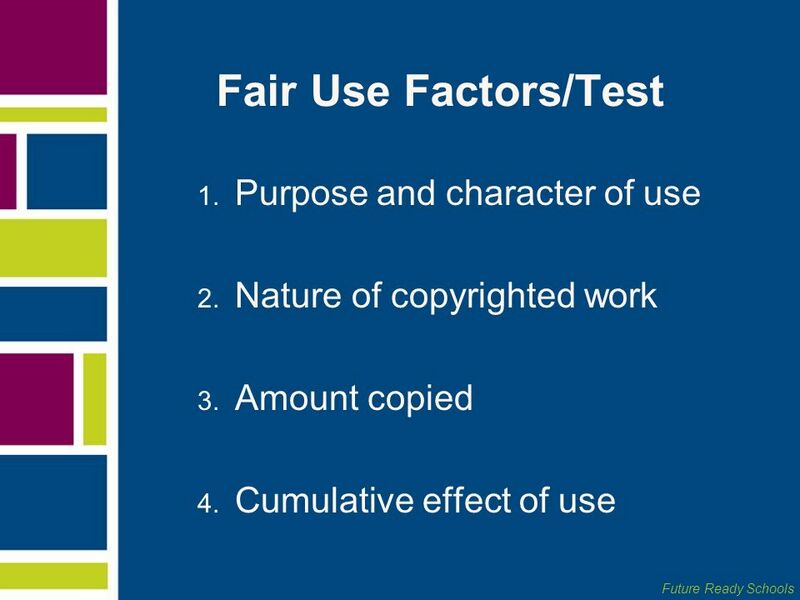 Fair Use Guidelines Mary Galloway Texas Middle School Texarkana Independent School District Prepared by Christy Tidwell. 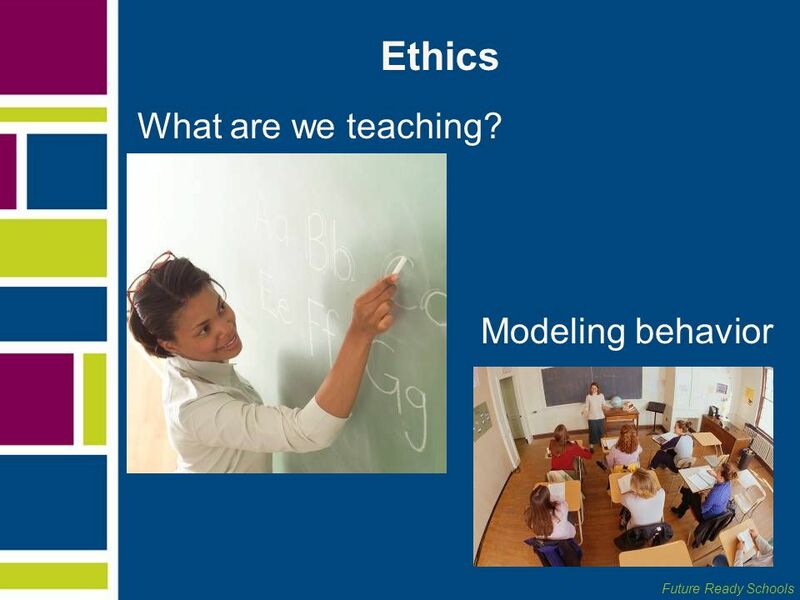 The T.E.A.C.H. 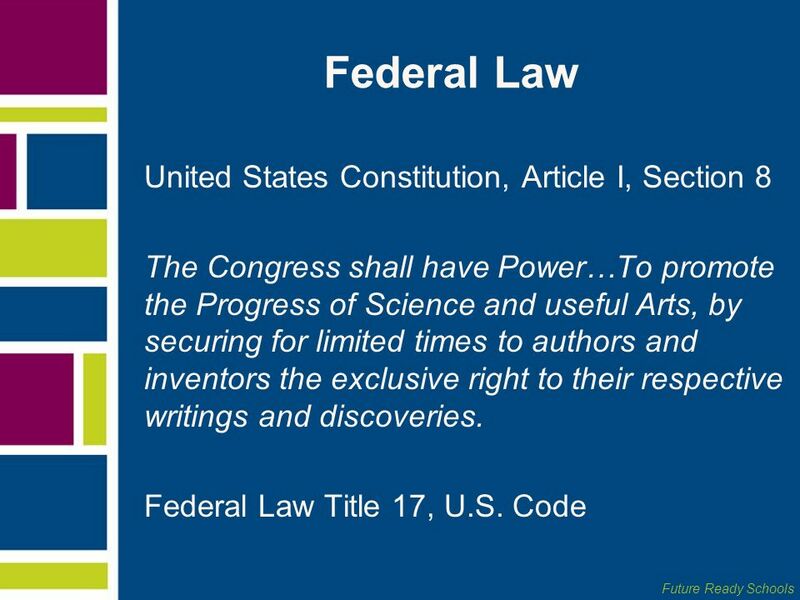 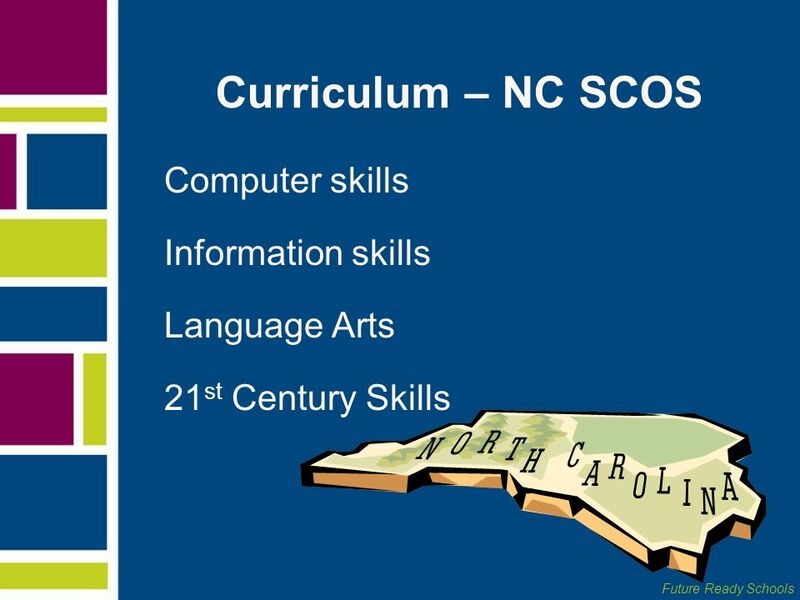 Act New standards and requirements for the use of copyrighted materials in education. 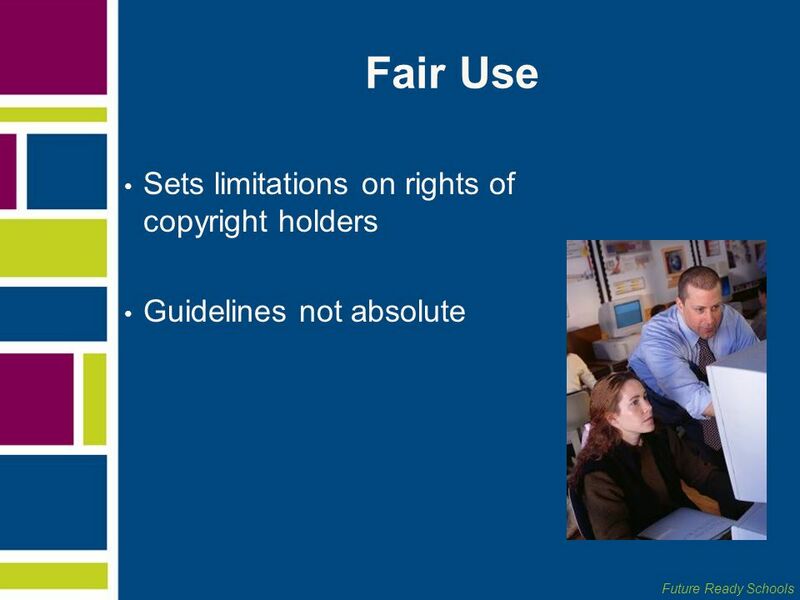 EDT 347 Education Technology Copyright and Fair Use. 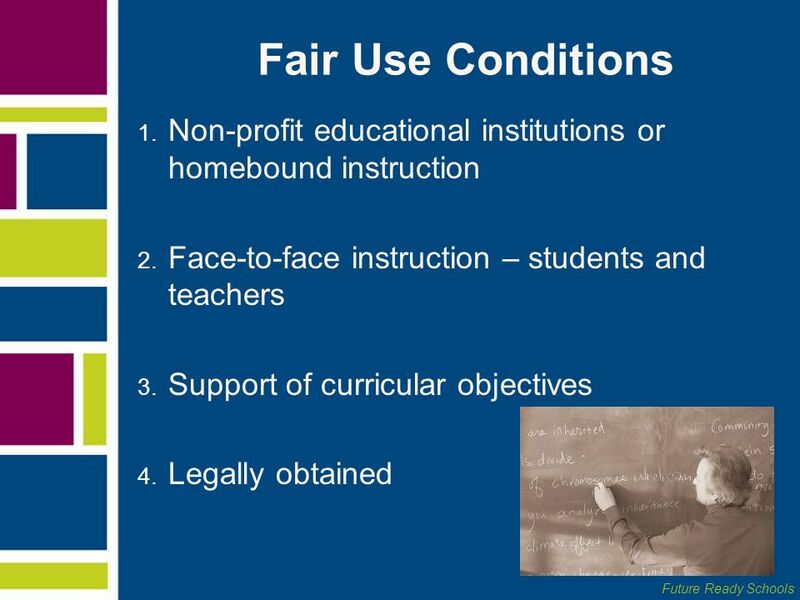 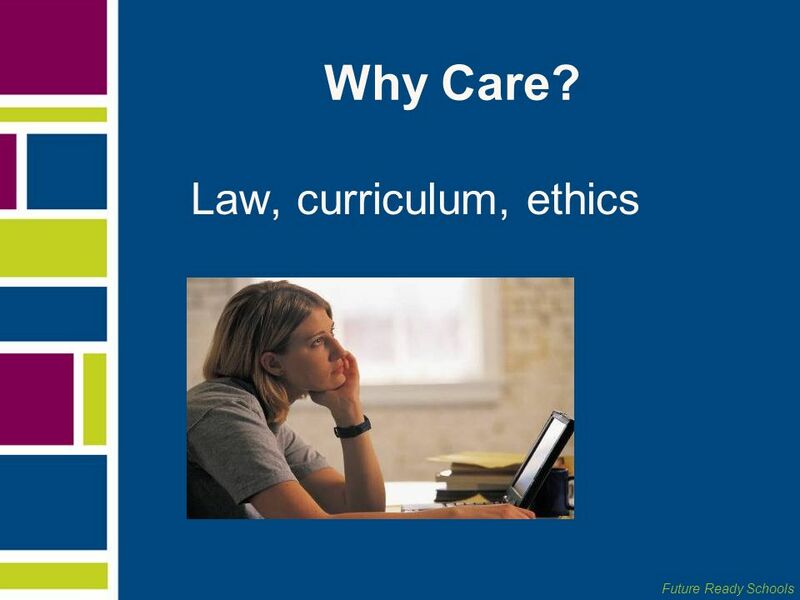 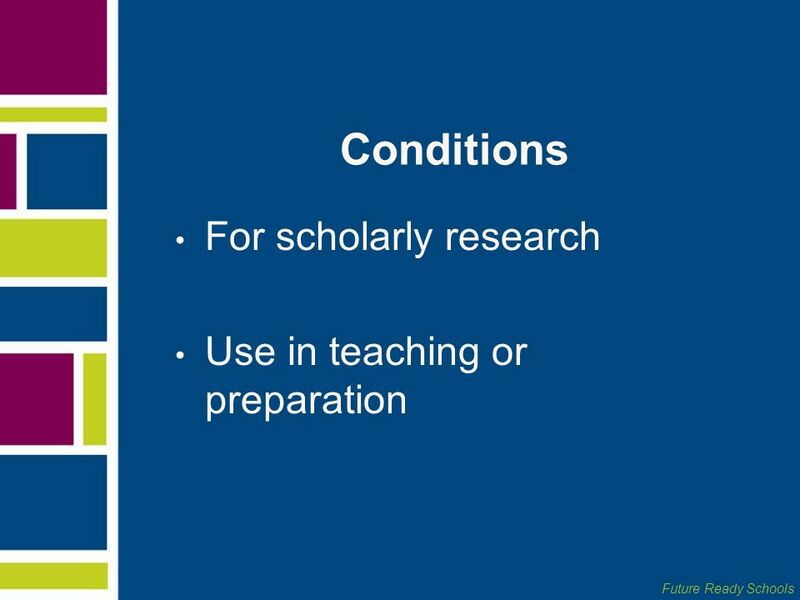 Copyright & Fair Use EducatorsStudents For Educators and their Students Presentation by Stephanie Huizinga.